Everybody now in this generation is not stuck to one job but instead are finding many opportunities which will give them security and good salary. When that individual gets such opportunity, that person tries to quit the current job by giving a resignation letter. But one has to be very smart and careful while leaving the job. That person should keep in mind that he leaves the office with good terms. If that individual doesn’t leave the job in good terms, the review may come bad which can affect the job stability in the new firm. Here are few tips mentioned below on saying goodbye to coworkers. Therefore, that person before leaving the job should keep in mind that leaving on good terms will affect in a very good way. Leaving job smoothly always boost up the confidence and brings out the enthusiastic attitude about starting a new job and giving the best in his work. Thus, that individual should leave the job with a good attitude and happy terms with its co-workers so that while in need of help and support they will be there. Office colleagues become the best of buddies as we spend most of the time with them through out the day at office. So biding a farewell when leaving office would be little bit difficult. The following mentioned are few tips on how to say goodbye to colleagues when leaving a job. It is rude to tell your co-workers or boss that it is the last day of the job on the last day of working. Letting everyone know 30 days or 15 days before will increase the impression and it would be a smooth transition from leaving that job and joining another one. It will help the employee to finish up the project and also the co-workers will finish up their pending work with that person. So it will be easier and helpful to everyone in that case. It is really good manners to inform everyone about the resignation from the job. This will increase a good image and respect. Meeting everyone before leaving the job is actually advisable because the co-workers will feel appreciated. Organizing or giving a farewell party for the co-workers outside the office environment is a great idea so that they properly bid farewell. By doing this, the co-workers will feel the closure because it will be the last time of the working day. Social media can also help in informing others about leaving the job if they are very busy with their schedule, so it will be a fantastic idea of letting them know through social media which will help in letting know everyone instead personally going to each and everyone and telling about the resignation. This can be an opportunity to show that the employee who is leaving is very professional and can also increase contacts via LinkedIn etc. The departure from office should be done by letting them know about the reason in short rather stretching it long, this will put down the impression of the employee. It should be short and sweet, even though the reason for leaving the job is because of the dissatisfaction and injustice faced in the office by that employee. The employee should make that he doesn’t tell anyone about it because it can also lead to fights while leaving the job. It’s very important to keep a professional attitude about this when saying goodbye to the co-workers. Keeping it professional is always preferred when such situation arises. While leaving the job the employee should carry a positive attitude. No matter whatever the reason the employee is leaving the job, it shouldn’t affect the attitude of the employee because a negative attitude doesn’t show professionalism. Therefore, keeping a positive attitude will help in the smooth transition from one place to another. Being calm and patient will help the employee from both the side of leaving the job and also joining a new job. Sending mail is also now one of the new ways to correspond about the information of the employee leaving the job. It would be very difficult and complicated to go door to door and telling about the details about the resignation. Therefore, sending a mail will be a good way of letting everyone know in that particular department about the resignation. It will ease the process of going to everyone and let know everyone about it. Sometimes it’s better to not let other people know the picture about your career prospect or if that employee tells its co-workers about the reason for leaving the job because of getting new, they may try to lure to take a new decision or they only try to think in the individual’s perspective. Jealousy always creates disparities among co-workers, therefore, it is advisable to not disclose much information to the co-workers. Even though if the employee may be very happy about the resignation but if that employee shows that attitude that he is very happy, it may lead to bad impression on the whole organization. This may affect the future growth of that employee’s career because the boss may try to give a bad review if the employee is very happy to move on with another job and showing any sign of remorse. In such situation instead making a very sad moment with crying and etc will give the individual more tough time to leave the job, therefore, the employee should keep his emotions under control and make sure that everyone understands your situation. By telling those about the wonderful journey or experience had with them will make the situation more joyful and less painful. Showing gratefulness will increase the respect among the co-workers and the organization. Before leaving the job it is good that the employee tells other people for how long that he has served the team. People don’t keep track of other people work life so it is better to throw some idea about the working period so that the co-workers will get amazed and get good understanding about the person. Telling other people about the experience will actually attract more opportunities in future. Giving much detail is not sometimes necessary but if that employee tells its co-workers about the next venture taken by him may amaze the co-workers. This will bring sense into the co-workers that the employee who resigned is getting a better job which will elevate more respect towards that particular employee. Therefore, telling about the new venture taken is rather more exciting instead of just keeping it as secret. Before leaving the job if the employee leaves its contact no- it might help in future to get better opportunities. Leave a phone number with the co-workers and it will be completely fine because no will unnecessary call up. Update the twitter or LinkedIn account about joining new work which will provide other people knowledge about the accomplishment carried over by the employee. Before leaving the job if there is anyone who is need of help or something it is advisable to do so because that enumerates the personality of that ex co-worker and there will be some people who will keep such employees in mind for a long time in a positive way. Always helping out a hand or good deed done never goes to waste, even though if the employee leaves the work. The employee who is always ready to help other people are often liked by all. In every organization, an employee always has close allies who help out each other in difficulties. So before leaving the job one should keep contacts with such co-workers. If that employee leaves the job by not informing his close friends, it will leave a very bad impression and also distance with the past ex-co-workers. Keeping a good relationship with the close co-workers will help in keeping contacts and relations. Before leaving the job, the employee may try to keep in touch with older employees but may fail to keep up with the plan made earlier which can create misunderstanding. If the employee makes false plans this may hamper relationship which is not good for a future record. Therefore the employees should make sure to not make plans which are not possible to make it happen. False promises always lead to disappointments so it is better to not make one. While leaving the job, some employees try to bring gifts for another co-worker as a Bid farewell gift. By doing so the co-workers will feel uncomfortable and difficult to accept the gift, therefore, it is suggested not to bring any gifts for any co-workers because that will put them in a very awkward situation. If the employee feels that there is a need to give something while leaving the job a box of chocolate or a thank you card is preferred in such situation because the co-workers will appreciate such token of gifts. Saying bad things about the company and removing all the frustration on the co-workers will upset that particular moment. During such situation, it is necessary to leave the job with a positive attitude instead of disappointing attitude dumped at other co-workers who have newly joined the office or the company. Don’t make it a tensed full situation but instead, make it a smooth transition. Saying good things about the company will actually help in getting new opportunities. Before leaving the job, the employee should not leave the office by not telling anyone about the resignation of the job. Giving everyone an idea about the resignation will not create a confusion as to why that employee is not coming to the office. Everyone in the office is inquisitive as to why the particular hasn’t come on time or why that employee is not coming to the office to do the pending work left by that particular employee, therefore a prior notice should be given. The pending work should be completed so that it won’t be a burden for the co-workers to continue with their work in future. If the employee leaves the work pending while leaving the job, the co-workers may get irritated on that employee for not completing the assigned duty on time and creating trouble for other for no reason. Therefore it is advisable to complete all the job before the last working day. When a person is leaving the job, the co-workers are more interested or attracted to the fact why that employee is leaving the job. They want to know everything about the reason and what will the employee think of doing something after leaving the job and etc. There will be many questions arising in the co-workers head compared to the boss or employer who is keeping a note of all the recruits. So if any employee making an exit from the company forever, it is advisable to bid farewell to the office in good terms. 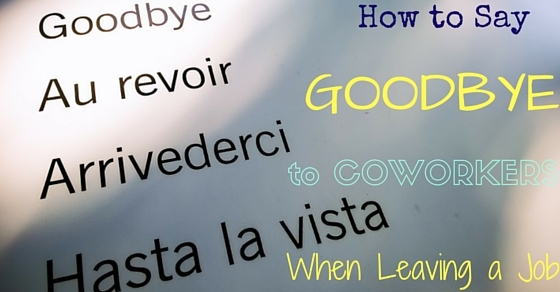 The above mentioned are few tips on how to say farewell to coworkers. Some people find it difficult to leave the job by telling everyone the reason for the resignation for the job therefore, mail does an amazing job of letting every know as to why that employee is leaving the job. It actually helps in keeping a record of it in the soft copy which will be as a future reference or record. Therefore before leaving the job the employee should fulfill all the formalities and complete all the pending work so that there won’t be any future problem for the employees and also the co-workers in future.